ARLINGTON, Wash. (CNS) — On a sunny Saturday morning, Ron and Gail Thompson headed off to Costco for a shopping trip with Gail’s elderly mother. It was the last time they would see their home along the Stillaguamish River. Had they left 10 minutes later, the Immaculate Conception parishioners would have been caught in the massive March 22 mudslide in Oso that buried their home, destroyed their neighborhood and killed at least 26. Fire and rescue officials said March 28 the official death toll was 17, the number who have been identified, and another nine bodies have been found but rescuers have had difficulty removing from the mud. The number of those still missing remained at 90. Although the Thompsons’ possessions are gone and they’ve been told insurance won’t cover the loss of their home, the couple is thinking of others. “That’s the amazing thing about Gail — she’s more concerned about neighbors who have lost family members than what she has lost,” said Deacon Phil O’Loane, a longtime parishioner of Immaculate Conception in Arlington, where Gail Thompson has been the parish secretary since about 1984. After staying in nearby Darrington one night after the slide, Gail Thompson told Deacon O’Loane that she needed to go to the emergency shelter in Arlington “to sit with the neighbors” awaiting word on their missing loved ones. “Ron’s been doing the same thing,” he said. The shelter at Post Middle School is located behind Immaculate Conception Church, where the Thompsons have been parishioners since the early 1970s. Deacon O’Loane and his wife, Rodi, who joined the parish a year or two earlier, live three miles downstream from the slide and had to evacuate their home the night of March 22 as a precaution in case the mud dam broke. The two couples are “very good friends,” Deacon O’Loane told Northwest Catholic, the magazine of the Seattle Archdiocese. “They are probably two of the most cheerful people,” he added, despite a series of work-related accidents that have left Ron unable to work for the last six or seven years. “We’re so grateful that they were spared,” said Joan Kastning, a parishioner at St. John Vianney in Darrington, which is a mission of Immaculate Conception. Kastning said she and her husband, Marvin, also narrowly escaped being hit by the slide. They were meeting friends at St. John Vianney to carpool to a birthday party south of Seattle. But Joan wanted to put something in the mail, so she and Marvin were running about seven minutes late when they arrived at the church. Oso is a rural town in Snohomish County and is about 55 miles northeast of Seattle. 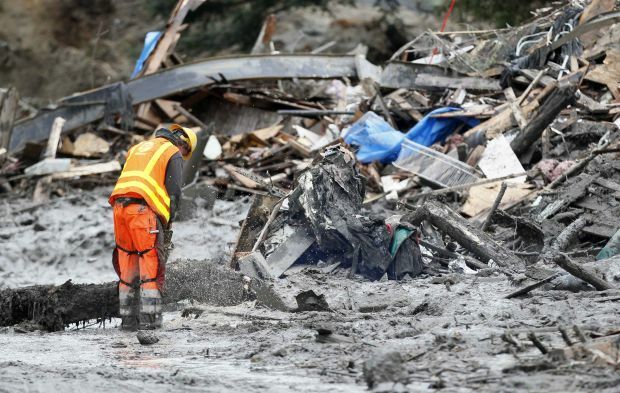 To help those affected by the Oso mudslide recover from the disaster in the weeks ahead, Catholic Community Services of Western Washington is “ready and standing by,” said Will Rice, the agency’s regional chief of operations. The local community is determining the type and extent of its post-disaster needs, which could involve things like initial living expenses for those who have lost their homes or helping victims navigate the disaster recovery services that are available. “We have 40 staff in western Washington that have gone through the training to provide case management services as secondary providers” if needed, Rice said. In the meantime, Catholic Community Services already has a contract through Snohomish County to provide children’s mental health services to the Darrington School District. A mental health therapist visits the district weekly, “working with kids and families that are in need,” Rice said. After the Oso disaster, the therapist’s presence will also “give us a way to understand the needs in the community,” he said. Parietti is a contributing editor for Northwest Catholic, the magazine of the Seattle Archdiocese, and local news editor for the website NWCatholic.org.